I heard the call of Cackling Geese this morning as I arrived at my office in the West Eugene Wetlands on this last day of summer. For the last four years I have lived here they have been my mindfulness bell from the autumn migration to the spring migration. They are returning from the Yukon-Kuskokwin Delta in Alaska where they breed, and will spend the winter in the West Eugene Wetlands and points further south. What is your mindfulness bell in nature? The weather this month has been anything but usual. Here in Oregon, we have been warm with little precipitation. Our mountains have maybe 15% of the snowpack they should have, our rivers are low, the rain comes in a misty drizzle. While I was in Pennsylvania the weather was odd; minus zero temps, little snow, lots of sunshine. But on my yoga mat I find stability in my own weather patterns. The fluctuations remind me to return to my breath, to return to the only thing that seeks my attention, the present moment. This month’s poem comes from my sunrise yoga practice, from within the storm. It has been a lovely cool and rainy day. 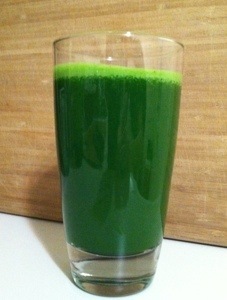 I started my day with a yummy green juice, using fruits and veggies I did not use during the fast. 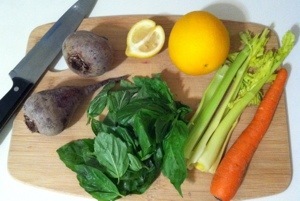 I had already started juicing when I eyed the lemon and ginger on the counter, so they got added at the last minute. 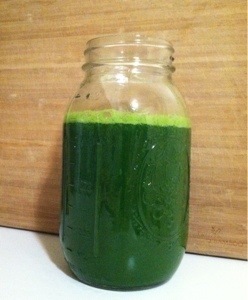 Mason jars are excellent for taking juice on the go. For supper this evening we made stuffed portabello mushrooms. I apologize for not taking pictures of the prep work, but the boyfriend and I were chatting and cooking together. Sauté the garlic and onion in a little olive oil on low heat. 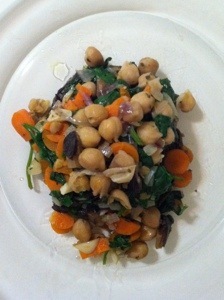 Add carrot and chickpeas. Sauté for a few more minutes. Add spinach and herbs, then cover until wilted. Scoop the inside of the portabello out and add to the mix. Heal the mixture into the mushroom. Place in original pan used to sauté the “stuffing”. Heat, covered, on low for 10-12 minutes, or until mushroom heated all the way through. I highly recommend buying all your ingredients in the beginning. Great motivation to keep going when it gets tough. In the days after the fast be sure to keep drinking plenty of water. 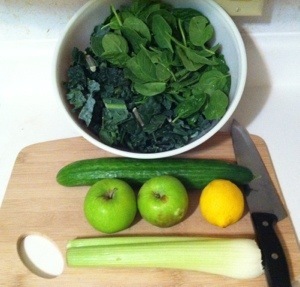 I have struggled with this because I have been back to my regular routine. Salt is not as important an ingredient to my cooking at this point. I find that my tastes have change significantly, and I enjoy the natural flavors, even with potatoes. Don’t get me wrong, salt has its place. But for now, less is more. Well, I will sign off for now. Until later…. 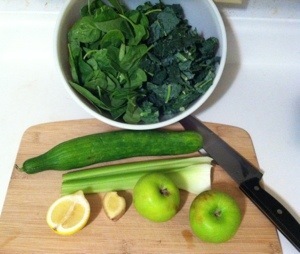 Happy Juicing! This morning I sank my teeth into a gloriously juicy granny smith apple! 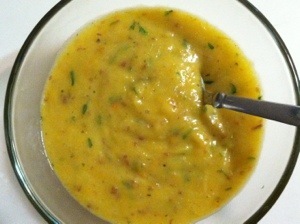 For supper I made a simple Potato Leek Soup. I will admit to using frozen, sliced leeks. 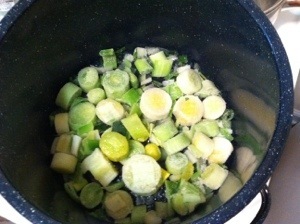 But, after five days of chopping vegetable five times a day, I took a little of the work out of the kitchen. Sauté the leeks in a little olive oil. 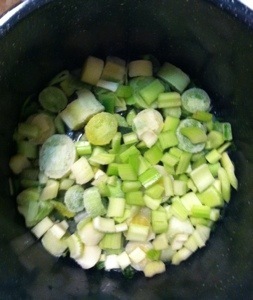 Add celery and garlic, sauté for five minutes. 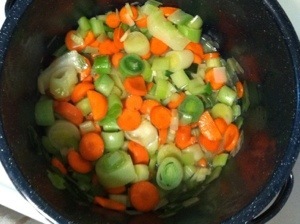 Add carrots, sauté 5 more minutes. Finally add the potatoes and simmer for 25 minutes. 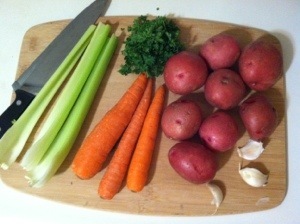 *Note: I put the potatoes in a bowl of water as I am dicing them. After rinsing a few times until the water is clear, I just cover the potatoes with water. 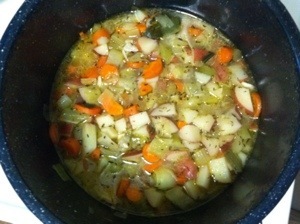 Then I add the potatoes and water to the soup pot. 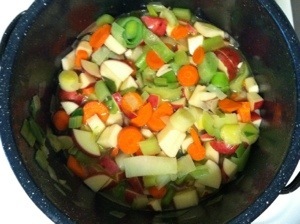 I added about a half cup more water, but keeping the final soup creamy is key, so no more water than that. The veggies are not quite covered. I added dried thyme, a pinch of dried rosemary, a pinch of salt, a dash of pepper (okay six or eight grinds on the grinder) , and a bay leaf to the simmering pot. Let cool for for 20 minutes or so prior to pureeing. 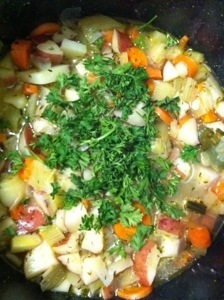 Add fresh parsley just before putting in blender. 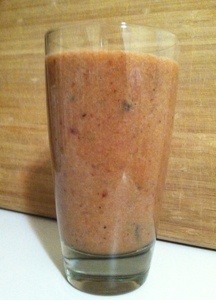 Okay, so no, I did not juice today, but I did smoothie with kale. 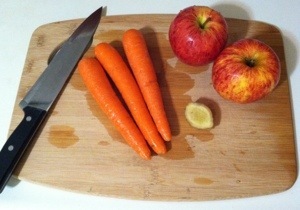 Tomorrow I will be back to juicing once a day. My belly is content with the fruits and veggies I ate, and I had to be extra aware to not be “stuffed”. A full belly is a phenomenon not experienced in a few days. There’s lots of grumbly action going on in there. 🙂 I am still drinking between two and three liters, which was surprising, but quite good. A few reflections on the reboot. This particular one recommended a cup of herbal tea in the evenings, but I never got that far. With the morning hot water, the coconut water, and five juices taking about 30 minutes prep and cleanup each, I ran out of time. And I usually had already drank nearly four liters of water so I didn’t feel the need. When it is recommended to stay near a bathroom, believe me, it’s great advice. I probably peed every 20-25 minutes during waking hours. 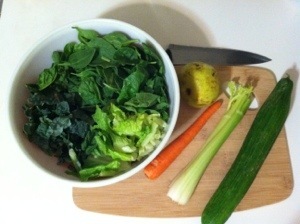 Tomorrow I will share the cost of the fruits and veggies, just for the reboot, and other reflections as they arise. This is it! 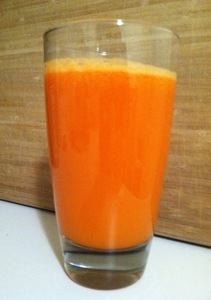 The final day of my 5-day juice fast. 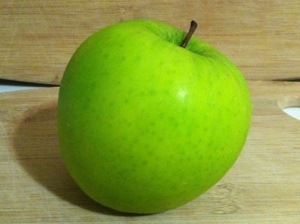 I am so looking forward to sinking my teeth into a green apple tomorrow morning. 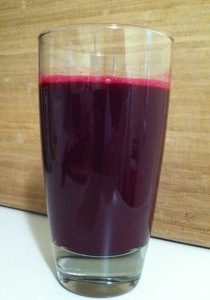 In the meantime, I enjoyed my favorite of all the juices tonight for my after-supper drink. Without further ado, the final line-up…. By the way, the boyfriend liked the peach pie delight so much he was trying to lick the inside of the glass to get the last drags! 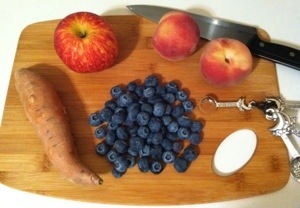 And he doesn’t even like sweet potatoes or most of the other juices I make. Follow up and reflections tomorrow. 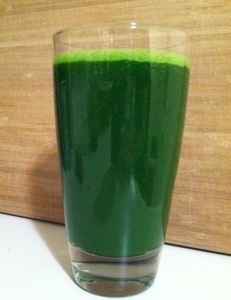 Happy Juicing!